FLAGGING GROUP HOME PROBLEMS: State officials said at a legislative briefing Thursday that their agencies must do more to flag financial mismanagement at group homes — problems similar to those that went unheeded at an Anne Arundel County facility where a 10-year-old disabled foster child died this month, writes Doug Donovan for the Sun. GAS EXPORT FACILITY: A squabble between the executive and judicial branches of state government and the failure of a bill this year in the General Assembly may have ultimately guaranteed approval of the wetlands permit for a temporary pier for the proposed Cove Point liquid natural gas export facility, writes Bryan Sears in a news analysis for the Daily Record. The die may have been cast for this week’s decision in a Court of Appeals ruling made nearly two years ago. CALL IN MILITARY: In a Thursday briefing with Frederick County leaders, Sheriff Chuck Jenkins said a “full deployment of military resources” to the U.S.-Mexico border is needed to address the illegal-immigration issues he witnessed during his recent trip to Texas, reports Bethany Rodgers for the Frederick News Post. HEROIN DEATHS CLIMB: Gov. Martin O’Malley announced Thursday that the number of heroin-related deaths in the state has continued to climb despite efforts by his administration to dramatically reduce overdose deaths before he leaves office in January, Jenna Johnson of the Post is reporting. BIZ SURVEY SEASON: It’s the season for business-climate rankings. For Maryland, this year’s rankings are more of the same. Our state tends to rank well in measures of our substantial potential for economic growth, near the bottom on assessments of tax and regulatory climate and somewhere in between for overall business friendliness, writes Donald Fry for Center Maryland. Surveys offer insight, but not definitive answers on specific approaches for business-climate improvement efforts. Fray recommends finding a long-term strategy to fix some of the problems, rather than focusing on the negatives. D.C. CONSTITUENTS FILL HARRIS’ OFFICE: The offices of U.S. Rep. Andy Harris were caught off-guard by the number of D.C. residents who came as “constituents” to his office to complain about the lawmaker, a move designed to highlight how much the congressman is infringing on their lives, reports Clinton Yates for the Post. NEGATIVE CAMPAIGNING: College professors Richard Vatz and Lee Weinberg write in the Sun that there may be no more enigmatic concept in politics than negative campaigning. Virtually no one publicly supports it, almost every non-shoo-in political principal uses it, and almost no two people mean the same thing when they refer to it. 3rd COMPLAINT FILED AGAINST HOGAN CAMP: The Maryland Democratic Party filed a complaint Thursday alleging that Republican gubernatorial candidate Larry Hogan had illegally used Change Maryland, a watchdog group he operated, to promote his upcoming campaign. The State Board of Elections dismissed two similar complaints earlier this month, but the Democratic Party said it was offering new information that had not been fully considered, reports John Wagner in the Post. ARUNDEL COUNCIL HOPEFUL GETS ATTENTION: A controversial Anne Arundel County Council candidate is making waves in Maryland’s gubernatorial race. Late Thursday night, Democratic gubernatorial nominee Lt. Gov. Anthony Brown’s campaign called on Republican candidate Larry Hogan to “disassociate” from Michael Anthony Peroutka. Hogan’s camp quickly responded by disavowing Peroutka, a Republican running for a County Council seat representing Severna Park, Arnold and Broadneck who is also a secessionist. A leader of the Republican Party will meet with Michael Peroutka on Friday and ask him to clarify his affiliation with an organization labeled as a hate group. Joe Cluster, executive director of the Maryland Republican Party, said some of the groups linked to the Millersville attorney are “concerning” to the party. Rick Hutzell reports the story for the Annapolis Capital. Comedian Bill Cosby and pilot Herb McMillan, the Anne Arundel delegate. 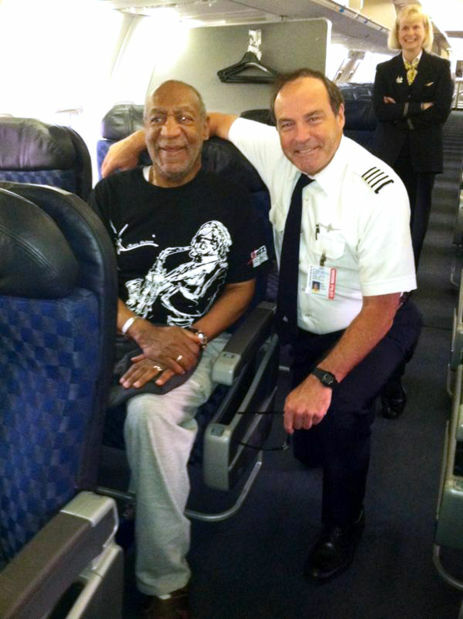 COSBY ON MCMILLAN FLIGHT: A 1980s TV dad recently took a trip to Dallas — and a Maryland lawmaker was driving the plane, Shantee Woodards writes in the Annapolis Capital. Del. Herb McMillan, R-Annapolis, who is a pilot for American Airlines, was flying from Hartford, Conn. when he noticed Bill Cosby on board. Apparently, the comedian was headed to a benefit at a children’s hospital in the Dallas area, McMillan said. DELANEY’S COMPLEX PROPOSAL: In a commentary for MarylandReporter.com, UMBC professor Roy Meyers writes that U.S. Rep. John Delaney’s proposed “Partnership to Build America Act” would allow U.S. corporations to avoid taxes when they repatriate profits that are now booked overseas, if they purchase bonds that would be used to build infrastructure. The rhetoric supporting the bill is attractive – “bipartisan,”“build America,”“partnership” – but, Meyers writes, it distracts attention from the bill’s complexities. It is wise to remember that if you don’t understand a financial arrangement, then it’s time to watch your wallet. O’MALLEY LOSES LONGTIME STAFFER: Even as he prepares for a potential White House bid, Maryland Gov. Martin O’Malley is continuing to lose key State House staff, a phenomenon typical for a governor nearing the end of his tenure, writes John Wagner for the Post. The latest to depart for the private sector is Rebecca Mules, one of O’Malley’s legislative lobbyists in Annapolis who had been his longest-serving aide still on the government payroll. SSA SYSTEM STILL NOT WORKING: The Social Security Administration has spent nearly $300 million to develop a computer system to speed processing of disability claims, but the system still isn’t working after six years, according to a newly released report. Yvonne Wenger reports the story for the Sun. KURTZ BACKLASH: Montgomery County Council members took issue with a column by Josh Kurtz, a Center Maryland columnist, calling some of them minor league, Bill Turque reports in the Post.